Some handy tips to optimize your workspace and reduce the occurrence of those aches and pains! Quite a lot us spend the majority of our time sitting in front of a computer screen, in fact if you are reading this you probably are right now! Most of us adopt a poor work posture and as we spend a lot of time in this position we put our bodies at risk of repetitive strain injuries, fatigue, headaches, eye strain, neck, back and shoulder injuries. Here we provide some simple tips to ensure that your workplace or home office is up to scratch in terms of taking care of your body. Ensure you maintain a correct upright posture keeping the natural spinal curves as close to normal as possible, a good supportive chair with lumbar support can help achieve this. The top of the computer screen should be at eye level, with a slight tilt to the screen and your face should be around 50-60cm from the screen. Your hips and knees should be at around 90 degrees, the use of a footrest is also helpful in reducing stress on the lower back and lower limb, it is important to have both feet placed on a solid surface (ground/footrest). Your workspace should be setup so that things frequently used are within easy reach, do not reach for things from a sitting position. Standing up to get these objects can also be helpful in breaking the cycle of poor posture and getting your body moving. Stretching your neck, back, shoulders and legs throughout the day can also be very helpful in reducing the risk of repetitive strains on the body. Talking to your Chiro or Physio can help as they can provide specific stretches for areas of your body that may be cause for concern. Alternating between work tasks that require different muscular activity can again reduce the risk of repetitive strain injuries. Again! Good posture is key! always ensure natural spinal curves are maintained and that your head remains over your body a good distance from the computer screen. 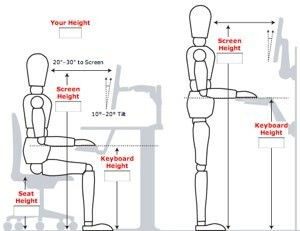 All of these tips implemented into a workspace can help to reduce the increasing incidence of computer/desk related pain. At Synergy Healthcare, we see these presentations daily and along with conservative treatment, improving workspace ergonomics is one of the most effective tools in reducing the risk of repetitive strain injuries, fatigue, headaches, eye strain, neck, back and shoulder injuries.